Our friends over at ThemeFuse have asked us to share something really special with you. They’ve given us permission to give away 3 free WordPress themes to our awesome readers. If you are a WordPress blogger, then you definitely want to check this contest out. Three bloggers will win the contest, and each will receive one free premium WordPress theme. How cool is it that? If you’re one of the winners, you will get to choose whatever theme you want from ThemeFuse’s extensive library…absolutely free. Does that sound good to you? Well, read on to learn how to enter to win. Once you’ve completed these 3 steps, hold tight. We will be announcing the winners in one week! Why Should You Want To Win? 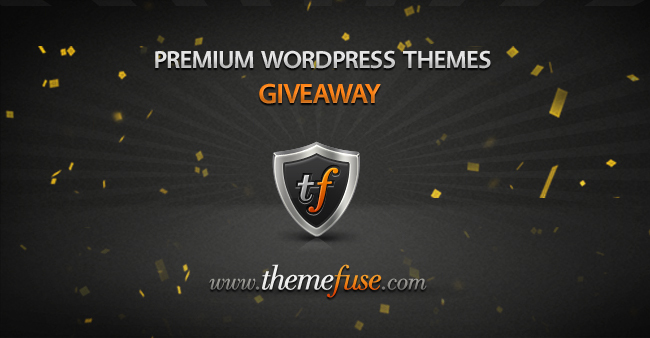 ThemeFuse is one of the best companies out there that is offering premium WordPress themes. They’ve taken the time to design high quality themes for a wide array of blogs. Whether you’re sharing your passion for fashion or are attempting to launch an online business via your blog, ThemeFuse has a theme with the right style and functionality to help you reach your goals. In fact, ThemeFuse can help you get your blog up and running in just a few minutes. They’ve recently partnered with a trustworthy hosting company, and now offer hosting services that come with a complimentary domain. In addition, they will happily install WordPress on your site for free. Find out more about this incredible service. Check out a few of the awesome WordPress templates available from ThemeFuse. A gorgeous wedding WordPress theme to help you showcase your love to friends and family. The perfect theme for sharing the story of your life or travels via WordPress. This theme is for those bloggers who want to put a professional touch on their words. Not only that it is perfect for your personal blog or portfolio, but you can even post videos, photos, links from your iPhone. An unique WordPress theme for Real Estate Agencies and Brokers geared at converting clients and building credibility in the market. A gorgeous, responsive kids WordPress theme ideal for a kindergarten or day care center website. This is what you need to do today: enter for your chance to win and you could soon be enjoying your own free premium WordPress theme.